To understand what craniocervical junction (CCJ) chiropractic care encompasses, a review of the basic anatomy is the starting point. The CCJ is the most complex joint region in the body. The CCJ, also referred to as the cranio-vertebral junction, is a collective term that refers to the occiput (posterior skull base), atlas, axis, and very importantly, the supporting ligaments. It is a transitional zone between a relatively rigid cranium and a mobile spinal column enclosing the soft tissue of the brainstem at the cervicomedullary junction (medulla, brainstem and spinal cord). It is critical to fully understand the neurology, biomechanics, and soft tissue integrity, including ligaments,(1) blood flow, and cerebral spinal fluid flow at the junction between the brain and the body. (2) Figure 1a provides details of the CCJ and the associated anterior supporting structures, including the alar ligaments, the apical ligament tectorial membrane, anterior atlanto-occipital and atlantoaxial membranes. The posterior supporting ligaments are comprised of the posterior atlanto-occipital membrane and atlantoaxial ligament. Figure 1b shows possible post trauma disruption of the posterior stabilizing ligaments of the CCJ. As shown in Figure 2, the vascular parameters of the CCJ include the vertebral arteries which pass through the transverse processes of the atlas and make a total of four ninety degree turns. Additionally, the internal jugular veins pass just anterior to the transverse processes of the atlas vertebrae. (4) The positioning of the segments of the CCJ affect blood flow and cerebral spinal fluid (CSF) fluid flow dynamics to and from the brain. The slice thickness in these cases should be a maximum of 2.8 mm. The axial slices were obtained in proton density (PD), which is best to see ligaments. 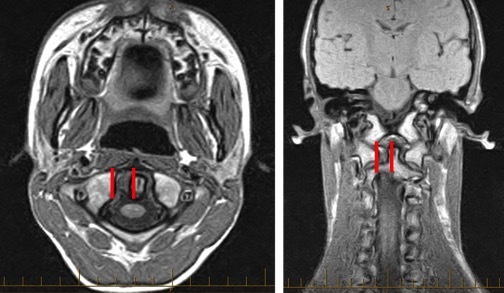 Upright MRI imaging of the CCJ revealing low cerebellar tonsils in all three planes is shown in the Figure 11. This positioning may obstruct the normal flow of CSF. CFS obstruction may contribute to headaches, head pressure, dizziness, brain fog, and the like. In 2012 the glymphatic system was postulated(14) with regards to lymphatic drainage and brain health. The lymphatic system that was discovered in the brain is dependent on CSF flow. The glymphatic system, as shown in Figure 15, is a functional waste clearance pathway for the central nervous system. The CSF flow, when obstructed, appears to have negative plausible effects on brain health. Therefore, having the CCJ aligned contributes to non-obstructed flow of CSF and will plausibly contribute to improved brain health and immune function. 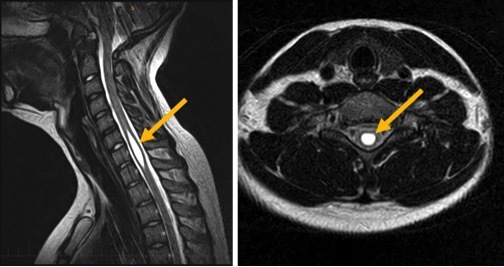 Study 1, Pediatric Syrinx: A 14-year-old male presented in the office following ten days of hospitalization at a Johns Hopkins affiliated children's hospital facility for severe head, neck, and upper extremity pain and sensitivity. On release, it was explained to him and his family that hospital protocol had been exhausted and his pain was hormonal. MRI imaging inclusive of the CCJ was ordered the day after his hospital release, which revealed a large syrinx and cerebellar tonsillar ectopia (CTE) with CCJ misalignment. We postulate that the CCJ misalignment affected the CSF hydrodynamics and the misdirected CSF played a major role in formation of the syrinx. The MRI images in Figure 16 show the location and magnitude of the syrinx as well as showing the CTE. As treatment, CCJ realignment was performed and additional CSF flow imaging was obtained and utilized in the CCJ correction. The patient resolved successfully with this treatment. Study 2, Chiari: A 19-year-old female presented to the office with eye-popping headaches, dizziness, and brain fog, which had been unremitting for the previous ten years since she had fallen on her head from a gymnastics uneven bar. She had an exhaustive list of neuro-medical consults which had provided no diagnosis or relief. She was told her issues "were all in her head." 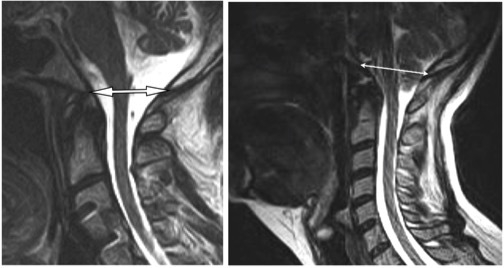 An MRI was ordered and revealed a Chiari of 22 millimeters as highlighted by the arrows in Figure 17. She responded fairly well to CCJ specific care for three years, but ultimately had a decompression procedure that has been successful. Study 4, Childhood Constipation: A six-year-old male presented for treatment post-motor-vehicle accident (MVA). He presented with typical neck, head, and back post-traumatic injuries. The clinical findings included unilateral erector spinae marked spasms and spinal imbalance, with a leg length discrepancy of just over ¾". Figure 19 illustrates the possible effects on the body related to subluxation of the upper cervical spine. Palpation of the upper cervical spine revealed unilateral articular joint pain. 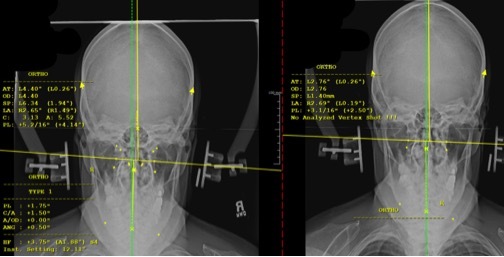 Figure 20 shows CCJ x-rays pre (left) and post (right) adjustment with orthospinology specific analysis of the misalignment. Post upper cervical adjustment, the upper cervical misalignment is reduced and unilateral erector spinae spasm is released and the leg length discrepancy is balanced, resolving the MVA symptomology with upper cervical chiropractic care. In addition to his injuries resolving, his mother reported that his painful constipation, experienced since birth, had also resolved under care. Balancing the central nervous system with upper cervical chiropractic care allows the body to neurologically repair itself. Trauma continues to be a major player in the disruption of the CCJ integrity. 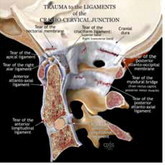 Birth trauma, falls, motor vehicle crashes, sports injuries, and other traumas affecting the head and neck relationship throughout our lives play into the ability of the CCJ to facilitate the brain/body connection. All patients deserve an appropriate evaluation of the CCJ for optimal brain health parameters and brain/body for our health. There is much more that needs to be studied and understood to optimize brain health. The upright MRI imaging is a platform that potentially could allow neurology, neuroradiology and other medical specialties to work together with board-certified chiropractic CCJ procedure specialists to benefit patients and families. Understanding the complexities of the CCJ should compel all health practitioners to study further and understand how to optimize the brain/body communication of the most critical joint region of the body. Enjoying this article? Click here to subscribe for more cutting-edge information, and interesting articles - don't miss a single one! I'd like to emphasize guidelines for practitioners who are on the front line to have high index of suspicion when they see patients with history of head or neck trauma, or autonomic symptoms involving the brain stem or cranial nerves, vertigo, brain fog, head pressure or pain of any kind, or anything from chronic constipation to cardiac arrhythmias. Autistic children should all be referred as early as possible. Unfortunately, there is an epidemic of young infants being diagnosed with GERD by pediatricians and pediatric gastroenterologists. These infants are symptomatic, but to put a two-month-old baby, who has just been through a birth process that more than likely affected his CCJ, on Pepcid or similar acid blocking drug is not good medicine, especially if his problem can be cured with a couple of gentle movements to his upper cervical spine. Complete multivitamin like BodyHealth Complete that contains 5000 u Vitamin D3 and K and activated folate. If chemical or heavy metal toxicity is part of the picture, then Metal Free and Body Detox can be added. In summary, it is the doctor's obligation to find the actual diagnosis that the patient has if he is to help the patient. All too often in complex cases the workup by the traditional doctor is too superficial to really do this and patients get put on symptomatic medication that has no chance of reversing the process, and a good chance that the medication will further complicate the problem. Meanwhile the actual cause has never been found. It is my experience now that very few doctors consider that CCJ pathology could be the underlying cause and, without knowing this, never pursue this as a possible diagnosis. Dr. Hunt and her team have trained up an expanding group of doctors who know this technology and who can be consulted to help you out. Whenever I hear on my initial interview any of the symptoms from the patient listed in Figure 5, I refer them to the upper cervical specialist for proper exam and, if needed, X-rays to confirm if there is a problem at the CCJ. This has been the most significant breakthrough in my education in many years, and it has upgraded my success results with patients tremendously. For me this has meant an upgrade in my listening skills so that when the patient mentions a key symptom(s) or answers one of my questions that my index of suspicion jumps into action and I refer them. I know if you learn from this to listen for it and pursue it, it will do the same for you. The Townsend Letter has been publishing outstanding articles such as this for decades, but promoting 'alternative' ideas comes with a cost. Please click to show support for independent voices in medicine! 6. Flanagan MF. The Role of the Craniocervical Junction in Craniospinal Hydrodynamics and Neurodegenerative Conditions. Neurology Research International. 2015;Article ID 794829. 7. Fischbein R, et al. 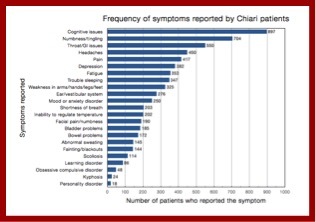 Patient-reported Chiari malformation type I symptoms and diagnostic experiences: a report from the national Conquer Chiari Patient Registry database. Neurological Sciences. 2015;36(9):1617-24. 9. Riacos R, et al. Imaging of Atlanto-Occipital and Atlantoaxial Traumatic Injuries: What the Radiologist Needs to Know. RadioGraphics. 2015; 35:2121-2134. 11. Grostic JD. Dentate Ligament – cord distortion hypothesis. Chiropractic Research Journal. 1988;1(1): 47-55. 13. Iliff JF, et al. A Paravascular Pathway Facilitates CSF Flow Through the Brain Parenchyma and the Clearance of Interstitial Solutes, Including Amyloid β. Science Translational Medicine. 15 Aug 2012:4(147): 147. 14. Hunt JM. Observations at the Craniocervical Junction Using Upright MRI. The Chiropractic Choice (ICA digital magazine). April 2017. Parts of this paper 'borrow' content from a paper written by Dr. Hunt for the International Chiropractors Association (ICA) digital magazine, The Chiropractic Choice, reference 14. Dr. Hunt thanks the ICA for allowing use of this content. Dr. Hunt also acknowledges the excellent illustration inputs from Ron Tribell of Axis Arts (reference 3) which help visualize the most complex joint region of the body. Dr. David Minkoff graduated from the University of Wisconsin Medical School in 1974 and was elected to the "Phi Beta Kappa" of medical schools, the prestigious Alpha Omega Alpha Honors Medical Fraternity for very high academic achievement. He then worked for more than 20 years in the area of traditional medicine before making the switch to alternative medicine when he and his wife, Sue, founded LifeWorks Wellness Center in Clearwater, Florida. LifeWorks is now one of this country's foremost alternative health clinics, offering a wide range of cutting-edge protocols. In 2000, Dr. Minkoff founded BodyHealth, a nutrition company which offers a unique range of dietary supplements to the public and practitioners. Dr. Minkoff is passionate about fitness and is a 42-time Ironman finisher, including eight appearances at the Ironman World Championships in Hawaii. He also writes two weekly newsletters, The Optimum Health Report and the BodyHealth Fitness Newsletter. 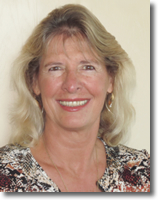 Dr. Julie Mayer Hunt is a second-generation upper cervical care chiropractor in Clearwater, Florida. She graduated from Life University in 1981 and started practicing with her father, Dr. David Mayer, at Mayer Chiropractic, which celebrated its 60th anniversary in February 2018. In 2000, Dr. Hunt completed her Diplomate in Clinical Chiropractic Pediatrics (DICCP), becoming the first board-certified pediatric chiropractor in Florida. In 2013, Dr. Hunt was appointed to the Florida Board of Chiropractic Medicine by the Governor and continues to serve on that board today. In 2016, Dr. Hunt was awarded her Fellow in Craniocervical Junction Procedures (FCCJP). 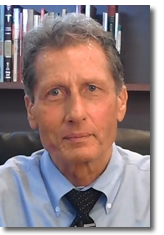 Dr. Hunt has presented at seminars and conferences concerning upper cervical care across North America and in Europe for the ICPA, the ICA, Society of Orthospinology, The Florida Chiropractic Society, Academy of Upper Cervical Chiropractic Organizations, and many other Upper Cervical and State organizations. Dr. Hunt has published several papers in a peer-reviewed journals and is a contributor to several chiropractic textbooks.